SORRY WALLY, YOU CAN’T EDIT THIS POST! This is a picture of me and Val(aka Wally). I refuse to believe that her move to Floridia is the end of our friendship and our yoga journey together. She has been my biggest supporter over the years and an incredible friend. There is a soft spot in my heart for her and if asked to explain why she’s so special to me, I realize there are no words to describe it. It is a knowing, a feeling. In matters of the heart, words can’t provide an explanation. Our friendship never needed huge amounts of time together or a whole bunch of give and take. The energy she gives off when she’s around is clean, clear and pure. Nothing hidden or secretive and that’s the energy I want to be in the presence off. So, it’s not goodbye, it’s “See you later”. After all, she is the “Common Sense Guru” and someone has to keep my head out of the yoga clouds! This post is dedicated to Val so those of you who know her, let me hear from ya! Some of the simplest things bring about the most pleasure! Here I thought I was the only one enjoying the weekly Yoga (summer) sessions under the open sky in the Park, but I was proven wrong. My announcing the continuation of the weekly Yoga in the Park sessions through September was received with cheers, joy, and enthusiasm – simple pleasures! Could this pleasure of this Yoga practice amongst nature arouse awareness that the same “thing” which created trees, water, birds, grass, (yes, and sometimes bugs! ), etc., is what created us! We didn’t create nature and no matter how callous one becomes in this life, when you see a beautiful sunset or notice a pretty flower, you are immediately present…in the NOW. The yoga practice is geared to take and keep us in the present moment, in the NOW. Think about the times you noticed something beautiful in nature….you feel an immediate stillness and presence. Your mind has to be still to notice beauty…if it is in the past or the future, you either have or are going to miss it! We had our biggest turn out yet at the park for yoga! Only two more Monday sessions left… hope to see you! 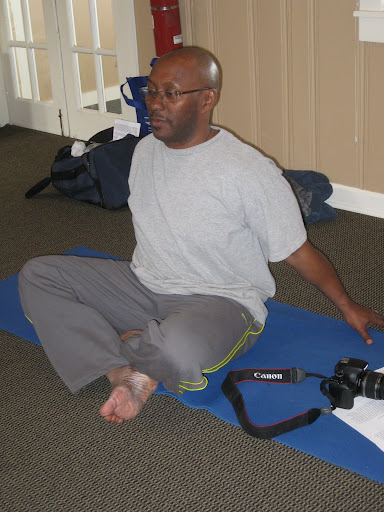 This is a picture of Greg, our “Forever Yogi” and our “Whenever, Wherever Photographer”! Take a look at these amazing pictures in the slide show below to recognize his talent for “taking the perfect shot of an opportunity when it presents itself”. Over the past year, Greg has taken many great photographs of us Yogis at various times and venues and many of them are featured on the website. Volunteering his time and skipping poses to capture the perfect shot is just one of Greg’s attributes! He is just one of the many amazing people I have the honor of being around on a regular basis. If you meet Greg, you know right away that he is an all around “good guy”, always willing to help and to be part of the action. Greg has been attending my classes for as long as I can remember. As his teacher, I am so proud of his dedication to and progress in his practice, watching his body respond. It doesn’t happen often that men like Greg, with a muscular physique, take my classes and stick with it! Thank you, Greg, keep looking for that perfect moment; we certainly enjoy looking at the perfect picture! This picture is amazing! Once again, at the (Ft Washington) Park and on the hilltop…and yes, that is the moon in the sky! When I look at this group picture, the first thought that comes to mind is that I am so lucky to be surrounded by all these nice people who have become my friends, not just students. Then I remember that luck has nothing to do with it…it was meant for each and every one of these people to have come into my life and I into theirs. I know this because of my firm belief in the Law of Attraction….what you think about, you bring about. Several years ago I began practicing positive thinking, visualizing how and what I wanted my life to look like. With dedication to this practice, which Yoga only enhanced, I raised my “energy” frequency to a higher level…more positive, less negative. It completely makes sense to me that all these amazing, authentic and kind-hearted people surround me! Also making sense to me is that all of the people who were around me with low “energy” frequency (negative) have slowly disappeared out of my life. I’m not lucky, I’m GRATEFUL! The Universe provides all that we need, effortlessly, if we aline ourselves with its Laws. Here are pictures of our last outing at Fort Washington park. We hiked up the hill to find this amazing spot! The incredible view fueled the practice which centered around balance postures. We were flying high last night and enjoying every minute! Hope to see some new faces next Monday! 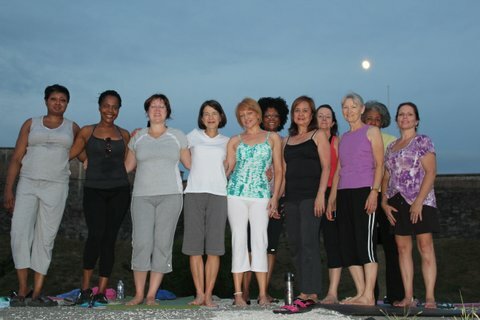 Had to share some pics of us yogis at the park! If you haven’t joined us yet, you now know what you’re missing….. I came to the decision years ago that I was no longer interested in “practicing ” Yoga…I was more interested in “being” Yoga. This transformation from “practicing to being ” allows me to take what I learn from my daily “practice” on the mat into my moment by moment living. As a teacher, I’m just giving suggestions to my students while they practice, I’m not addressing individual needs for that day…only the individual can do that. It’s not until you listen to that inner self directing that you actually “are” Yoga…up to that point, you are just practicing. My mantra for my students: DAILY HOME PRACTICE, DAILY HOME PRACTICE, DAILY HOME PRACTICE…. I learned a very important lesson about expectation from the HOB retreat. Because I was so excited and hyped up about the retreat, my expectations were too high and when you are that high, even though it’s a good high, you are still out of balance. As a result, disappointment hit me due to the weather and my own feeling that I wasn’t at my best teaching wise. It’s like two sides of the same coin. What goes up must come down…we live in a world of opposites. Made me realize that my daily yoga practice keeps bringing me back to that neutral state again and again and only in that neutral state can creativity and effortless flow happen! Now that I’ve learned my lesson, I’m content. Especially after seeing all the smiling faces in the pictures!